Here’s one of the file shots I drag out for stories related to guns, such as the one on House Bill 4145 below. 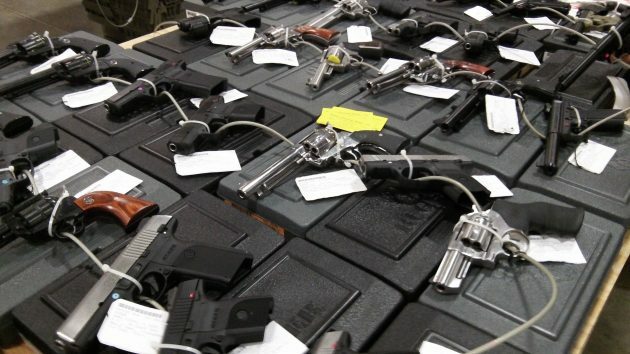 The legislature is in session, so naturally it is once again working to add to the circumstances under which Oregonians may be banned from buying or owning a gun. But this time, the bill that emerged from committee on Friday isn’t bad. It’s the kind of “reasonable gun regulation” that we hear so much about. Albany Rep. Andy Olson voted for the amended version of House Bill 4145 when the House Judiciary Committee voted 7-2 to send it to the floor with a do-pass recommendation. His fellow Republican from Linn County, Sherrie Sprenger, voted for the changes in the original text but then voted no on the bill. As it came out of committee, the bill would ban gun ownership by anyone convicted of the crime of stalking a member of his (or her) household. The ban would also apply to any subject of a restraining order obtained on behalf of a household or family member if the target of the order had a court hearing, and if the judge also found the person to be an imminent danger to the people the order is meant to protect. If the subject of the restraining order doesn’t ask for a hearing or doesn’t appear, though, the prohibition against gun ownership would not apply. This was a complaint among supporters of gun restrictions, and they might try to undo this aspect of the bill in the Senate. Despite lots of testimony pro and con before the committee earlier in the week, nobody knows whether banning stalkers from having guns will do any good. Skeptics will say that domestic violence is against the law already, so why would a violent personality enraged over some domestic matter care what the law says about having gun? But the kind of people who would injure or even kill members or their families deserve no kind of sympathy, so if their “rights” get stepped on now and then, tough. One plainly useful part of the bill would require the state police to be notified when someone is convicted of stalking or gets an anti-stalking restraining order. Then, if that person attempts to buy a gun and fails the required criminal background check, the state police under the bill must notify local law enforcement and the DA. Those agencies in turn must report to the state what happened as a result. And once a year the state police must issue a public report on all this. The added paperwork will be worth it. The public will get an idea how a piece of gun legislation works in a real world. Enforce current laws! We don’t need more. Outlaws don’t follow laws! There are enough laws on the books if they would just put teeth into them. There are already laws on the books that cover this. This is just excessive legislation which only makes politicians think it makes them look good to anti-gun people. Law-abiding gun owners deserve more protection than this. Our lawmakers just keep getting stupider and stupider. First, it only applies to those convicted of stalking a household member. Uh hello…folks don’t usually stalk members of their household, they stalk folks who USED to be members of their household or who were never members of their household to begin with. Then there is how to applies to Restraining Orders. Seriously…it doesn’t apply to folks who don’t request a hearing?!? Ever consider that the reason why they don’t request a hearing is because they are GUILTY?!?!?! It should absolutely, unequivocally apply to those to don’t request a hearing! I for one am glad the legislature is wasting time on such a bill. There is much worse it has in mind to get to.